You can remove backups created by backup copy jobs from Veeam Backup & Replication configuration or permanently delete backup chains from the target backup repository. When you use the Remove from configuration option, you delete records about backup copies from the Veeam Backup & Replication console and configuration database. The backup copy job remains in the list of jobs and all backup files remain on the target backup repository. You can easily import backups to the Veeam Backup & Replication console for restore operations at any moment. In the inventory pane, select Backups. In the working area, right-click the backup copy and select Remove from configuration. To remove all weekly, monthly, quarterly and yearly backups created by the job, select the Include archived full backups check box and click Yes. 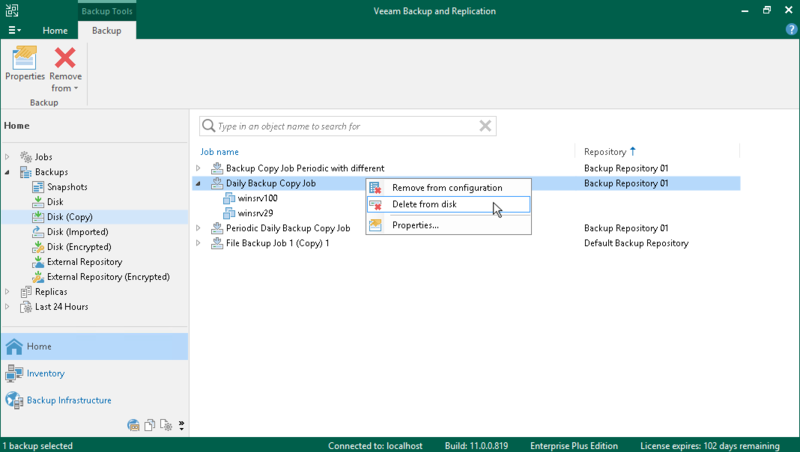 When you use the Delete from disk option, you delete records about backup copies from the Veeam Backup & Replication console and configuration database and, additionally, delete backup files themselves from the target backup repository. This option can be used for the whole backup copy or for some machines in the backup copy. In the working area, right-click the backup copy or a machine in the backup copy and select Delete from disk. To remove all weekly, monthly, quarterly and yearly backups from disk, select the Include archived full backups check box and click Yes.